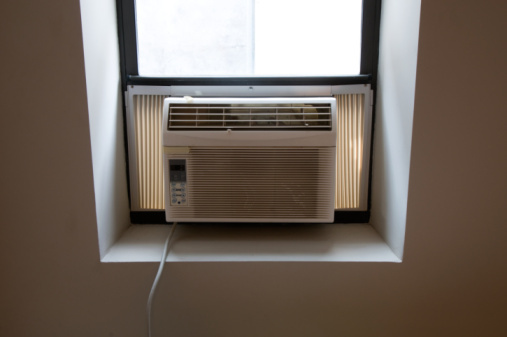 Swamp coolers are a popular alternative to more expensive and complex air conditioners, which use a refrigerant to cool the air. Swamp coolers use a process known as "evaporative cooling" to reduce the temperature of a space. Simply put, the swamp cooler pulls hot air through a moistened pad. The evaporation of the water in the pads reduces the temperature of the air, and the cool, moist air that results is blown into the room. A simple stand can be made to support a swamp cooler from standard window frames, using only materials available at most hardware stores. 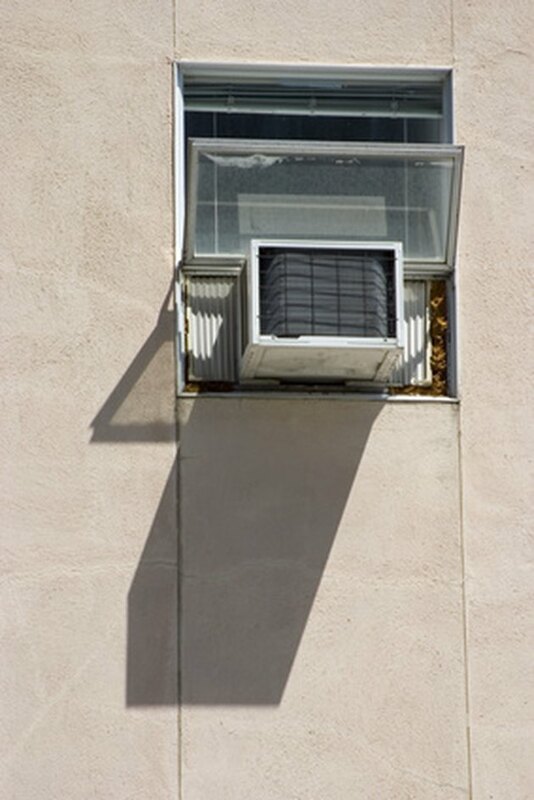 Most evaporative coolers are made to be mounted on the outside of a window. Use a stud finder to locate the studs below the window in which you will be mounting the swamp cooler. Mark the locations of the studs lightly with a pencil. Your stud finder will have instructions for its use, which will vary depending on a variety of factors such as whether it detects the center or edges of a stud. Cut two lengths of 2-by-4 that are as long as the distance from the floor to the ledge of the window. Cut a further two lengths of 2-by-4 that are 3 inches longer than the depth of the swamp cooler, and another three that are 7 inches shorter than the width of the window opening. The first two pieces of wood will be the legs to which the stand will be connected, while the rest make up the frame for the platform on which the swamp cooler will rest. Use deck screws to attach one of the 2-by-4s that is 3 inches longer than the depth of the swamp cooler to the end of one of the 2-by-4s that is as long as the distance from the window to the floor, forming an L-shape. They should be joined with their flat, wide faces towards the inside and outside of the L-shape (like an L written with a pencil rather than a marker). Do this with the other pair of 2-by-4s as well. Using the shorter pieces of 2-by-4, connect the two L's together into a single frame. One of the short pieces should be used at each end, and the third at the angle between the two arms of the L. From the side, this completed frame should still look like an L, while from the front or back it will be a frame as wide as the window. Cut a piece of plywood that is as wide as the window opening and 3 inches longer than the depth of the swamp cooler. This will be the surface of the platform on which the swamp cooler will rest. Screw the plywood to the top of the part of the stand frame which will extend out the window. Install the stand by putting it in place at the window (the legs extending down to the ground, the platform extending out the open window) and screwing the legs into the studs you identified in the wall. If the ledge of the window extends into the room far enough that the legs of the frame aren't flush against the wall, then use wooden shims to make up the difference. Paul Bragulla began writing professionally in 2010, producing online articles. His experience as a researcher in beamed energy propulsion means that he can write knowledgeably about topics such as optics, laser operation and high-speed photography. Bragulla holds a Bachelor of Science in physics from Rensselaer Polytechnic Institute.